Increase your company’s efficiency and productivity with quality forklifts and industrial cleaning equipment. 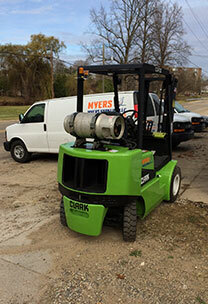 At Myers Forklift LLC in Dowagiac, MI, we offer a wide range of material handling equipment at affordable rates. Whether you need reach trucks for your warehouse operation or ride-on floor sweepers for your workplace, count on our team for dependable solutions. With the many types and brands of forklifts and cleaning equipment available, determining what is most useful for your company can be confusing. Our team can help you assess your needs and make it easier for you to pick the right equipment for your business. Rest assured we will do everything we can to save you time, money, and energy when you come to us for your equipment needs. Buying forklifts and cleaning equipment can be easy and hassle-free with help from our service technicians. Just let us know what you need and we will do what we can to assist you. Get in touch with us today for effective solutions to your lifting and commercial cleaning woes.